We often like to think the thing that makes videogames special is “interactivity.” But this idea of being able to “interact” with the creative work doesn’t really tell us anything special about videogames at all. It’s not that videogames aren’t interactive – of course they are. But, in their own ways, all media are interactive. We don’t have to keep pressing buttons to make a film carry through from start to end, but we have to use other parts of our body (our eyes, our ears, our brains) to turn a series of disconnected, imitated scenes performed by actors we’ve seen a dozen times before filmed in giant warehouses into a narrative of original characters overcoming some challenge. We take the sights and sounds presented to us by a film, and then we interact with those sights and sounds by turning them into the textual thing we consume. So when we talk about videogames as being interactive, we are in fact talking about a very narrow, very specific kind of interaction, a kind of bodily, participatory engagement where the progression of the game relies on our corporeal actions. This is, obviously, a very crucial part of videogame play worthy of focus, but it is not the only interaction happening when we play videogames. Just as with film, photography and all other audio and/or visual arts, our fingers are not the only part of our body interacting with the game. Our eyes, ears and brain are all tangibly engaged with making sense of the game, with transforming it into some kind of textual object for our consumption. There is more interactivity happening in videogame play than what we talk about when we talk about interactivity. Two games in particular highlight this full spectrum of interaction, of engagement, being performed by parts of our body other than those that are explicitly touching the videogame hardware during gameplay: Alexander Bruce’s Antichamber and Bernie Schulenburg’s Where Is My Heart? Both of these games demand a constant and concentrated interaction from my brain, so much so that I find myself physically exhausted after playing them for short periods of time. When I play them, I am reminded that my mind is part of my meaty, tangible body, and that my mind is doing a whole lot of work for me to be able to comprehend these games – to comprehend any game. 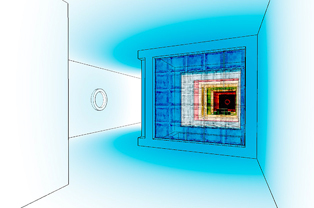 Antichamber’s spaces are impossible. Space doesn’t work here the way it works in our own world. Corridors and rooms overlap each other. Space bends around on top of itself. I can never see the world as it actually “is” because it exists beyond my comprehension as a being existing in a world where space is mapped out on three consistent dimensions. In Antichamber, the room beside me might also be the room above me. I might turn around and the hallway directly behind me isn’t the hallway I just walked down to get to my current location. Time and space are weird here. These impossible spaces require me to be constantly consciously aware of where I am in the world. This is something I don’t have to do in most games – at least, not to the same extent. Playing Grand Theft Auto IV, if I want to drive to the next island, I see the intersection I need to turn left down to get onto the bridge without a second (or even a first) thought. I’ve been up and down these streets so many times that I have built an unconscious, habitual knowledge of my surroundings. My mind is still constructing them, to be sure, but with such little effort that I hardly notice. But in Antichamber I need to constantly reorientate myself not just in relation to my immediate surroundings, but in relation to how I got here and how I would have to travel to get anywhere else. My current location in Antichamber isn’t a point; it’s a trajectory, dependent as much on my current location in time as in space. Similarly, Die Gute Fabrik’s Where Is My Heart? doesn’t allow an unfiltered view onto the reality of its world. 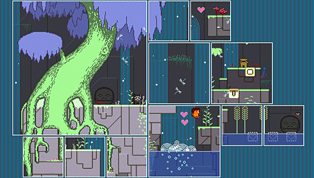 Unlike Antichamber, a world does exist here that makes sense: a 2D, side view of a pixel-art forest. The challenge in Where Is My Heart? is that I never have an unmediated view of this world. Instead, it is sliced up into tiles and shuffled around the screen like randomly placed security monitors. Your character might walk off a monitor in the top left of the television and onto a monitor on the bottom right. On paper, it doesn’t sound that hard. 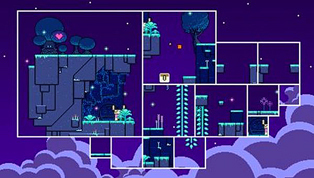 You learn what tiles are this platform and what tiles are that platform, and off you go. The difficulty, though, much like Antichamber, is having to constantly keep that world stitched together in my mind. My brain must work to keep that world together for me to navigate. The second I stop thinking about it, the second I forget that you can’t just walk into the next screen, it all falls apart. It’s like having to run on a treadmill to watch TV. Except it isn’t my legs doing the work, it’s that juicy lump of meat inside my skull, that piece of meat we like to forget is even a part of our bodily existence at all. Both these games demand so much of my mind simply to make them navigable that they can’t help but draw attention to the very corporeal existence of my mind and consciousness. Playing Antichamber or Where Is My Heart?, my brain uses so much energy just to keep the worlds conceptually together that I quickly become exhausted. Physically exhausted – from thinking! It reminds me that my mind was always embedded in my bodily existence, as just so much meat. And, by extension, these games draw attention to the very corporeal interactions my mind is having with the images and sounds on the TV. This facilitates those more traditional interactions happening with my fingers, as much in these special games that it is made explicit as in the countless games where I don’t even notice. Videogames are interactive. That’s a point that can’t be argued. The issue with such a statement is that it tends to exclude a whole heap of other ways our bodies couple with videogames to produce our engagements with them. The pure exhaustion I feel after trying to stitch together (and keep together) the worlds of Antichamber and Where Is My Heart? remind me that it’s not just my fingers that are interacting with the screen, but my entire sensory and perceptual apparatus. Alexander Bruce, Antichamber, Bernie Schulenburg, Grand Theft Auto IV, Where Is My Heart?